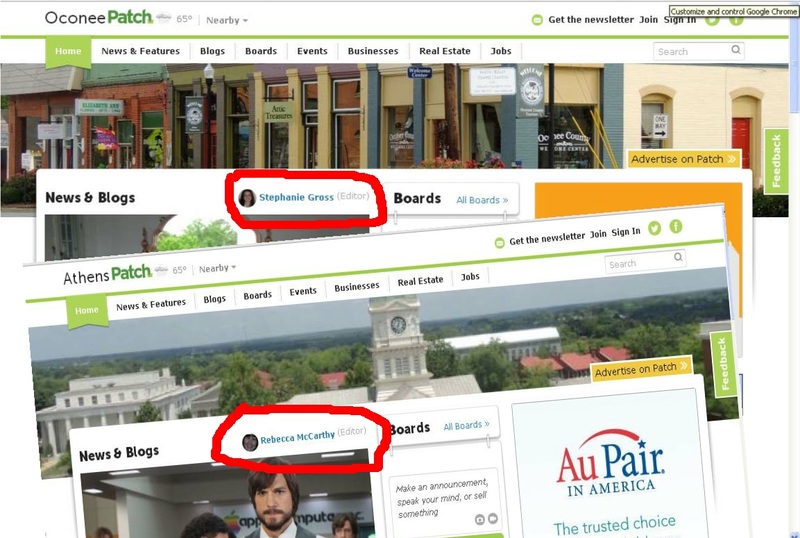 Rebecca McCarthy continues to be listed as the editor of the Athens Patch site. Not so fortunate were Patch editors in Monroe, Loganville-Grayson and Barrow County. The Gwinett Daily Post reported that the editors of the Patch sites in Monroe, Loganville-Grayson and Barrow Counties were laid off on Friday. I checked each of the sites this afternoon and found that the three sites listed different editors today than yesterday. Anthony Duignan-Cabrera is listed as editor of both the Loganville-Grayson and Monroe sites. According to his profile on LinkedIn, he is vice president, editorial director at Patch.com, based in the New York area. The editor of the Loganville-Grayson and Monroe sites on Friday, according to back filings on the web sites, was Sharon Swanepoel. Krist Reed is listed as editor of the Barrow Patch site today. She also is listed as editor of the Dacula site, as she was yesterday. Deanna Allen was listed as editor of the Barrow site yesterday. The Oconee site this afternoon contains stories by McCarthy and Reed, both also listed as editors. The overlap in stories across the Barrow, Oconee and Athens sites is unusually high. The joint listings suggests further changes in the operation of the area sites is likely in the future. Oconee Patch Editor Gross said in an email message this afternoon that she is “unable to comment” on anything about the changes taking place. Blogger Jim Romenesko, who follows and reports on media developments, has an email message on his site today that he received from someone who seems to have inside knowledge of the terminations on Friday. Romenesko reported yesterday that AOL CEO Tim Armstrong said in a nine-minute conference call yesterday morning that 40 percent of the Patch workforce would lose its jobs that day. Geekwire reported yesterday morning that all Patch sites in Washington state were closing. USAToday reported today that AOL is laying off 500 employees at Patch, or about half of its total workforce, up from the Romenesko estimate. AOL plans to close or consolidate 150 of its 900 sites, according to the paper. Earlier estimates were that it would close 400 of its 900 sites. "Patch's strategy will be to focus resources against core sites and partner in towns that need additional resources," USAToday reports that AOL said Friday in a statement. "Unfortunately, with these changes we are announcing today, we will be reducing a substantial number of Patch positions." The Press Room for AOL has its last news release on Aug. 14, and that said nothing about layoffs or plans for cutbacks at the company. News of those plans surfaced in the media on Friday.